It pains me to speak ill of Pixar, a studio that has consistently provided me (and my family) with hours of indelible cinematic memories year after year. The original “Cars” is the only film from their library that is not in regular rotation in our DVD player (even the animated shorts compilation gets more love). But Pixar has demonstrated with “Toy Story” that their sequels can build firmly on the original and even improve in spots. So if anyone could put the film back on course with others in its catalog, it is Pixar. At the very least, they would give it a nice fresh coat of paint and oil change, right? I suppose even Pixar needs to pay the bills once in a while, and even though “Cars” was both their least commercially and critically successful, it was a merchandising goliath (with an estimated $5 billion in toys and such). 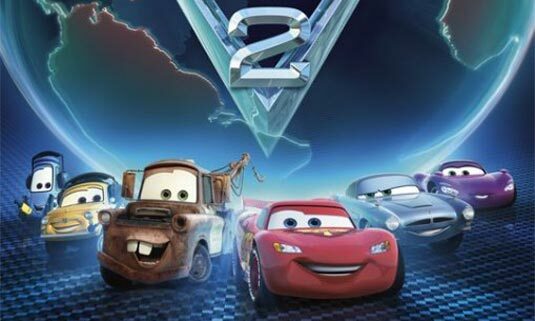 So now we find ourselves behind the wheel of “Cars 2,” which feels like the most elaborate direct-to-video sequel of all time (which, ironically, the second “Toy Story” was originally scheduled to be). And when we’re not being treated to hayseed pearls of wisdom, “Cars 2” packs it trunk with yet another lame attempt at ’60s-era British spy flicks (that is really the best they could come up with? Hasn’t Austin Powers successfully torpedoed this genre for mockery with “Goldmember?”). Michael Caine and Emily Mortimer give voice to Finn McMissle and Holly Shiftwell, respectively, two international spies who aim to stop a villainous vehicle with — what else? — plans of global dominance. The town of Radiator Springs, the one pit stop of humanity and character in the first film, is but a footnote, as are all it’s inhabitants. The film’s soundtrack, which was hackneyed in the first (did we really need another cover of “Life is a Highway”?) is equally uninspired here. Weezer’s contribution of “You Might Think” stays close to the original by The Cars (get it?). The best that can be mustered is the company’s continued commitment to visuals. Every chunk of gravel, tread of tire and sparkle of chrome is detailed as it is striking. They continue to end in the winner’s circle for animated excellence. Sadly, there is little else for anyone but the youngest of audiences to get from “Cars 2.” It puts the “formula” in formula racing. It is all quite jolly and fast-paced, a feast for the eyes, but there’s not much for the mind or the heart.